In my 2009 brachiosaur paper, I gave rather short shrift to the sacrum of Brachiosaurus — in part because there is no really good sacrum of Giraffatitan to compare it to. Also my own photos of the sacrum, taken back before I figured out how to photograph big bones, are all pretty terrible. As usual with these things, click through for the much more impressive full-resolution version (3809 x 3157 pixels). How big a sheet would you need to make one life size? Heh–a bedsheet. King size might do it. Wow nice! Beautiful pic. Gives a much better idea than Riggs’s blurry pics do of how this sacrum was distorted during fossilization. If only we’d known, we’d have told you. But we generally don’t know we’re going to post here until we find out. We currently have 59 unfinished drafts, and all of those are constantly getting leapfrogged by whatever happens to catch our eye at a given moment. Ahh gotcha. Here’s the fixed up version. …including top view. Tilting it in dorsal perspective produces some interesting effects. 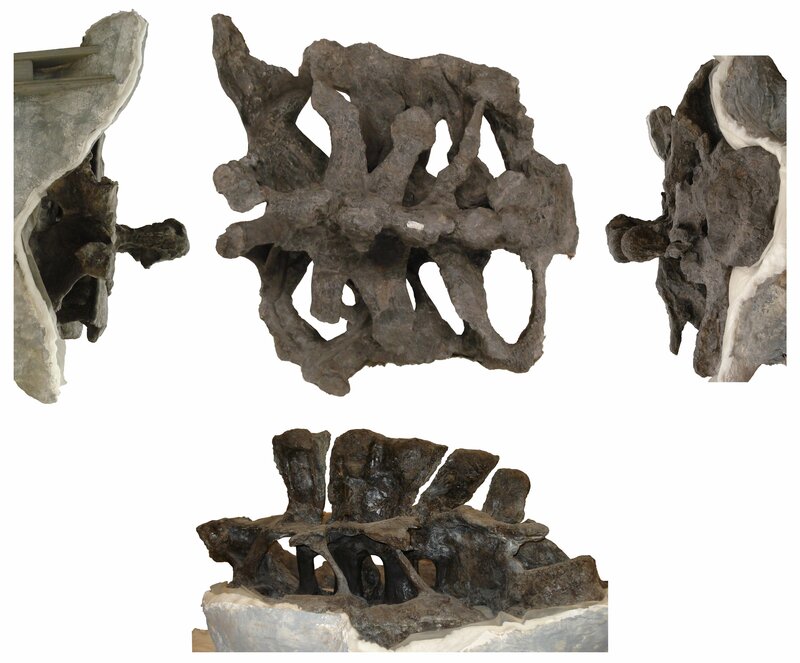 The flat sacral ribs actually look in some ways more like a Huanghetitan sacrum than a Giraffatitan sacrum.